We are Virtually Connecting from one more Digital Pedagogy Lab Institute (the third this year!) which takes place August 8-12 in Fredericksburg, Virginia. 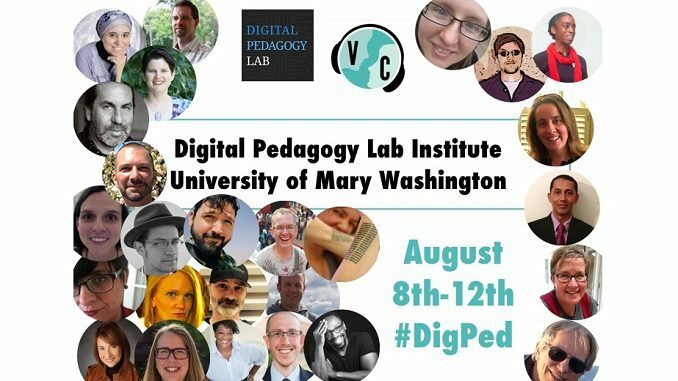 The event is jam-packed with people in the digital pedagogy field you will enjoy meeting, many of them appearing on Virtually Connecting for the first time! Also for the first time, Autumm Caines received a “Virtually Connecting” fellowship from the DigPedLab team. Details of Virtually Connecting sessions below – tweet us or leave a comment if you’re interested in joining. Meet keynote speakers Cathy Davidson, Director of the Futures Initiative, The City University of New York, and Tressie McMillan-Cottom, Assistant Professor of Sociology, Virginia Commonwealth University (both keynotes will be livestreamed at this link, YouTube link for Tressie’s here; YouTube link for Cathy’s here). Sean Michael Morris will also join them. Autumm will be onsite buddy and Maha Bali virtual buddy. This is a workshop entitled Praxis of Virtually Connecting taking place at DigPedLab UMW co-facilitated by Autumm Caines onsite (with help from Jesse Stommel and Sean Michael Morris) and Virtually Connecting members Maha Bali, Michael Berman, Kristen Eshleman and Apostolos Koutropoulos (AK) virtually. Meet education technology writer and “Action” track facilitator, Audrey Watters and (maybe, if she can make it) meet keynote speaker Martha Burtis, Director, Digital Knowledge Center, University of Mary Washington (Martha’s keynote is livestreamed at this link). Jesse Stommel, Director of Division of Teaching and Learning Technologies, University of Mary Washington & Director of DigPedLab will also join us. This hallways conversation will be shown live to participants in the workshop above. Autumm will be onsite buddy and Maha Bali virtual buddy. This is a hallway conversation building on the above workshop, with onsite guests Annemarie Perez, Lecturer, California State University Dominguez Hills, and Chris Gilliard, Professor at Macomb Community College and virtual guest Sherri Spelic, Leadership coach and educator, currently located in Vienna, Austria. They will be reflecting on inclusive networked learning from a race perspective in the US. I’m hoping to join you virtually for some of these fantastic-looking sessions! wonderful twitter convo ~ nap is about to overtake me (sr narclepsy, better than being a sr narc), so I may not be awake for first live session. with so many, I’m bound to make at least one though. I’d like to join the Thursday 4 pm globalized learning workshop! I am sorry Suzanne I totally missed this comment. The hangout was full with a waiting list…so you wouldn’t have probably been able to join. But I apologize for not noticing your comment earlier. Super-interesting discussions that are enormously helpful in informing ideas on the digital. Lovely to watch, listen, learn. Thank-you! Hi Maha, I would LOVE to be part of conversations in future and also would be happy to work as volunteer if you ever need extra pairs of virtual hands. In the meantime, so glad that I can listen in and participate asynchronously. Some amazing discussions that will really support my work in the next year available here. Thanks loads. S.